Home > VoIP Support FAQ > Yay.com App > How do I update my SIP User details in bulk? How do I update my SIP User details in bulk? Yay.com allows you to update your SIP Users in bulk through your Dashboard. Note: The following fields can be changed: Nickname, SIP Username, Password, Extension, App Mobile Number, Desktop Email Address. Changes to any other fields will be ignored. You can download your existing SIP User data, make the required changes, and then import the new data using the following steps. From your Dashboard > Users page, click on the 'Export Users' button. This will automatically download a CSV file of all of the active SIP Users in your account, including their Nickname, SIP Username, Extension Number. Make and save your required changes to the data in the CSV file. 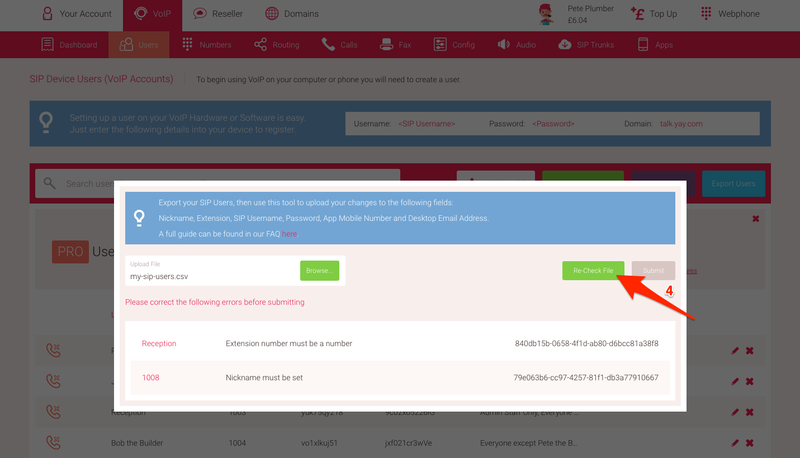 Remember only the Nickname, SIP Username, Password, Extension, App Mobile Number, Desktop Email Address fields can be modified. Any changes made to the other fields will be ignored. Back in the Dashboard > Users page, click on the 'Import Users' button, then click Browse to select the CSV file. We'll automatically check the data for you to ensure there are no obvious errors or required fields missing. If any issues are found, these will be displayed to you alongside the SIP User's UUID number (the 32 character identifier required for each SIP User). Once you have corrected the errors and re-saved the file, click the 'Re-Check' button and we'll re-check the file for you. If no issues are found in the data, the 'Submit' button will become available. Click this to confirm the SIP User update. The changes will be applied and a message will confirm to you once the updates are complete.